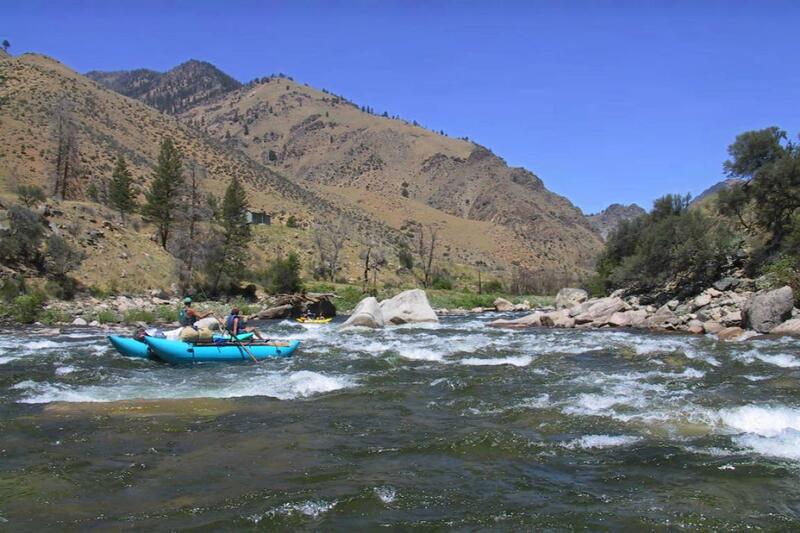 This is one of the best multiday river trips in the west, rivalling the Grand Canyon as a must-do trip among whitewater paddlers. Permits are required for private boaters, and are difficult to obtain especially in mid season. Apply for the lottery before January 31st. 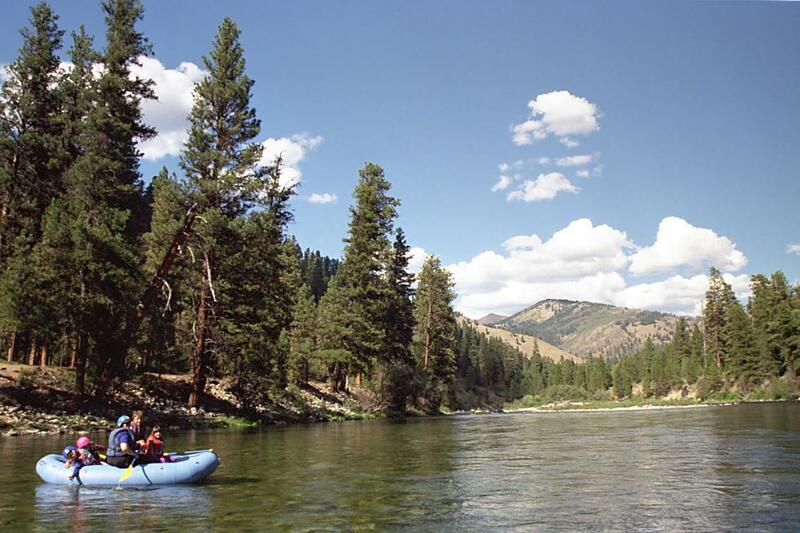 This 100-mile stretch of wilderness river is so famous that the words “Middle Fork” are usually interpreted as referring to this river, even though plenty of other rivers have a middle fork. 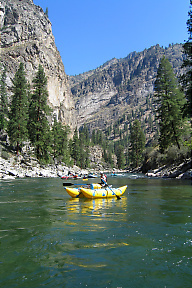 This river is justly famous: high-elevation forest at the beginning, clear water, non-stop rapids with many playspots, good fishing, half a dozen hot-springs, many side streams, Indian pictographs, and a cliff-bound voyage thru the so-called Impassible Canyon near the end. 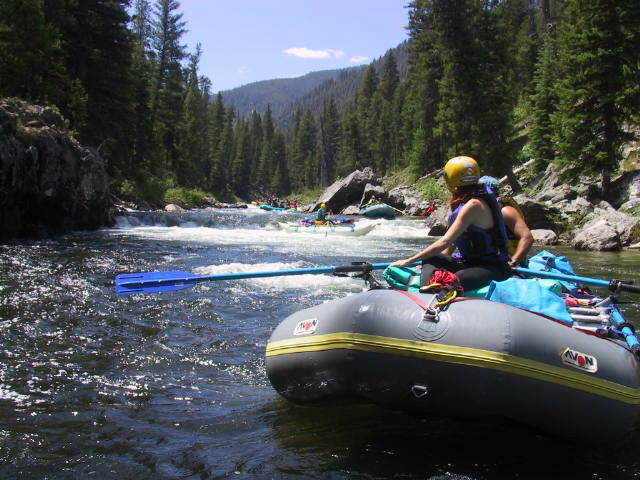 Despite all the whitewater excitement and wilderness isolation, this is one of the most relaxing and comfortable river trips anywhere. Weather can be cold at the outset, where the hot-springs are, but gradually warms up due to the 2610' elevation drop. The flow never lets up, so you don't have to paddle any flatwater at all. Splashy class II rapids are nearly continuous, interrupted occasionally by fun class III rapids. 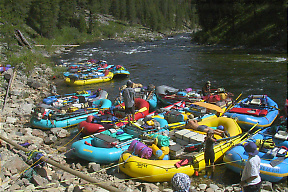 Sweep boats, a unique large craft that can steer back and forth but has no means to power upstream or downstream, are favored by the commercial outfitters to carry gear for guests. Median flows reach 6000 cfs in mid June. Flows are often much higher then. 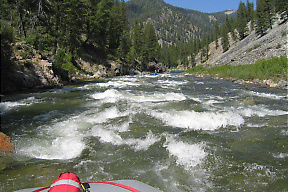 High flows used to be feared, and have killed or injured some boaters, but nowadays most rafters feel the river is not excessively difficult above 5000 cfs, and kayakers proficient in big waves often agree. By August, median flows fall below 1000 cfs, receding slowly into September. Self-supported kayak trips in September are feasible most years. 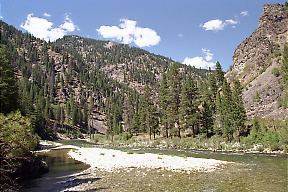 The Middle Fork Salmon can be run in early season, although the dirt road to Boundary Creek is often impassible until May due to deep snow. 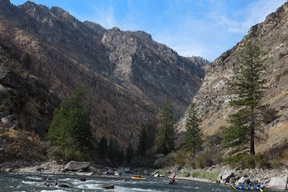 Some early-season boaters start on Marsh Creek, which crosses highway 21 (plowed in winter) 19 miles west of Stanley, merges with Bear Valley Creek to form the Middle Fork Salmon, and 14 miles later tumbles over class V- Dagger Falls, shortly above the normal put-in at Boundary Creek. This section can be hazardous due to logjams, which seem to change annually. 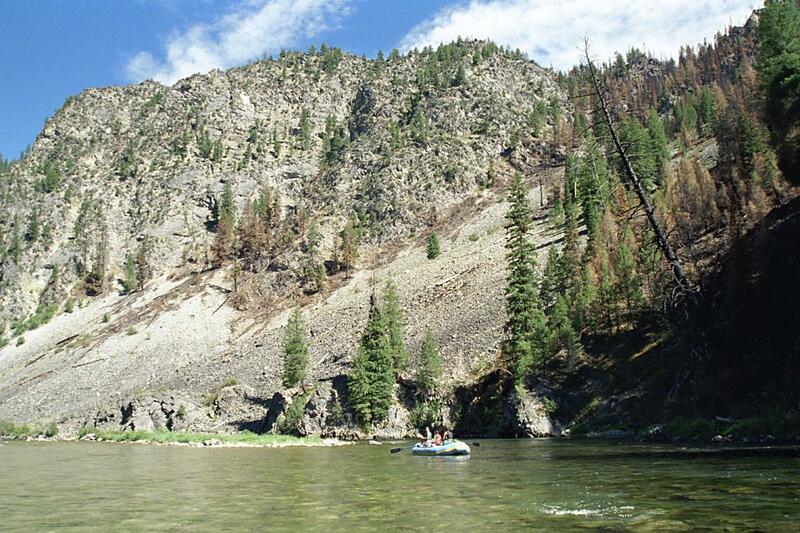 Although this is the largest roadless area in the lower 48 states, the wilderness is not complete. Trails follow the river until Big Creek at mile 78, and there are several airstrips along the way, including one at Flying B Ranch, where a general store sells ice and beer. 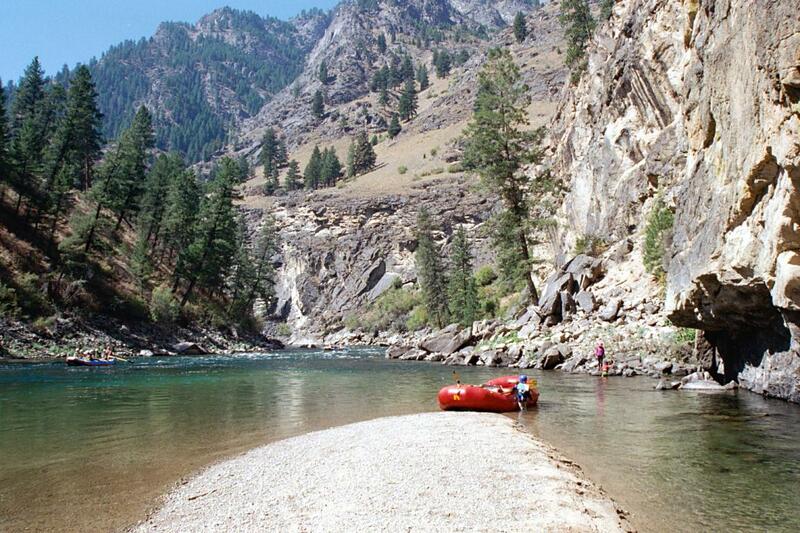 In late summer, to avoid bony rapids in the upper 25 miles, many boaters fly gear and passengers into the Indian Creek Guard Station, where there is an extra long but unpaved airstrip. This USDA webpage contains links to monthly percent-of-normal snowpack (BASN), and daily snowpack water-content data (BASS) that you can correlate. 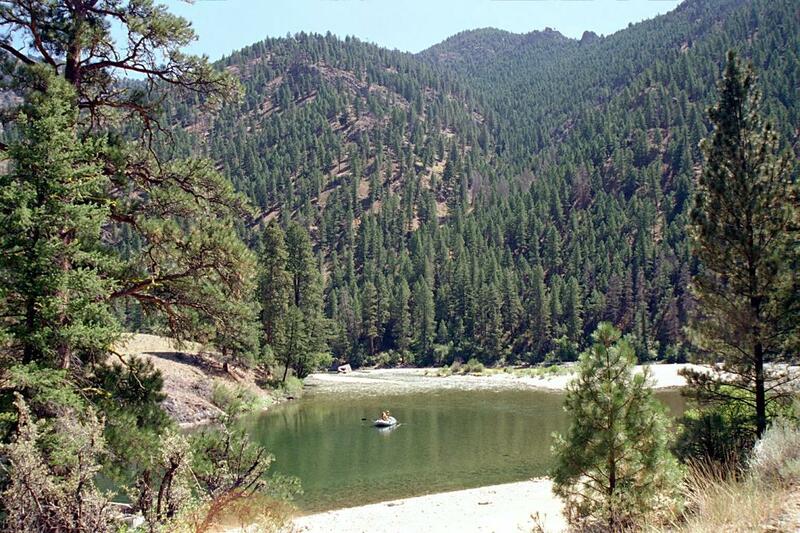 The USFS rangers assign campsites based on your listed preferences and preference lists of competing parties. 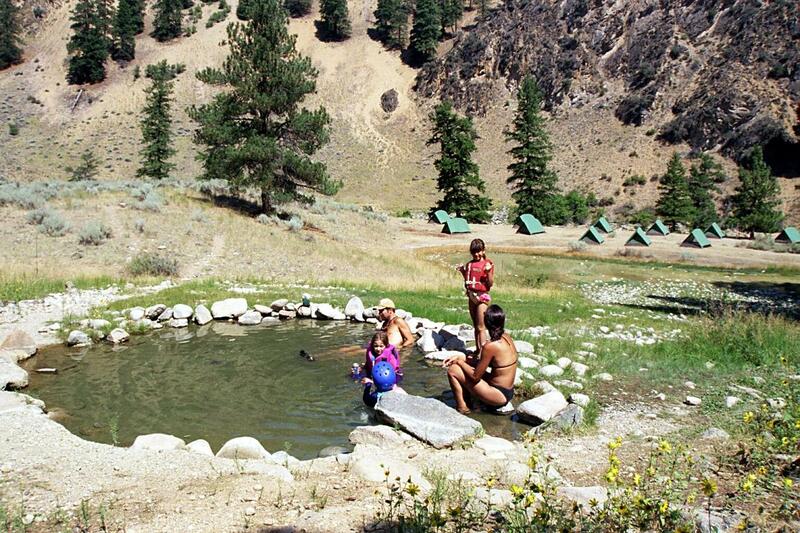 You are limited to one camp adjacent to a hot-springs. 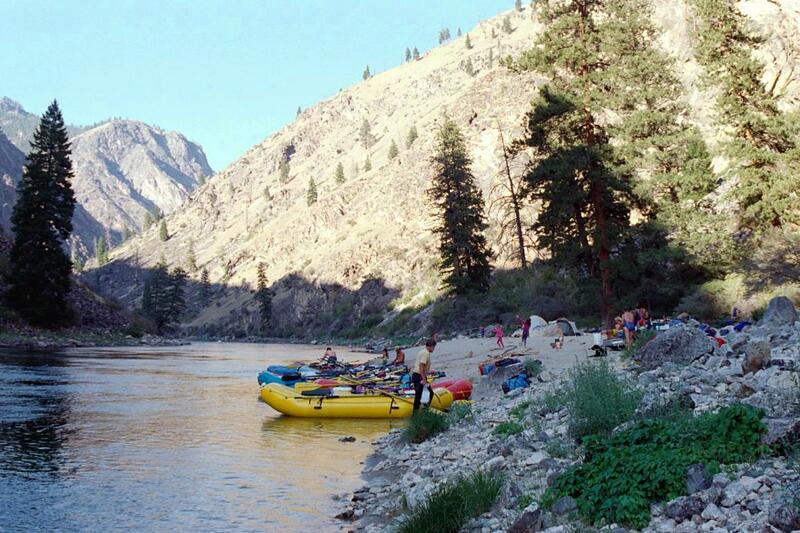 Most campsites are excellent and spacious enough for large groups. Pit toilets are in the process of being removed from the river corridor, so it's pointless to consider which campsites have one nearby (few do). 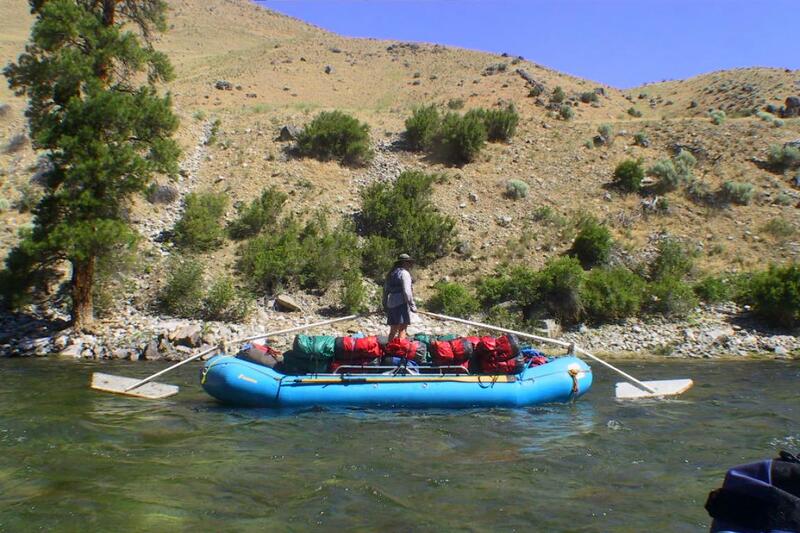 The USFS publishes a campsite inventory (available on the fed.us website) to assist your selection. 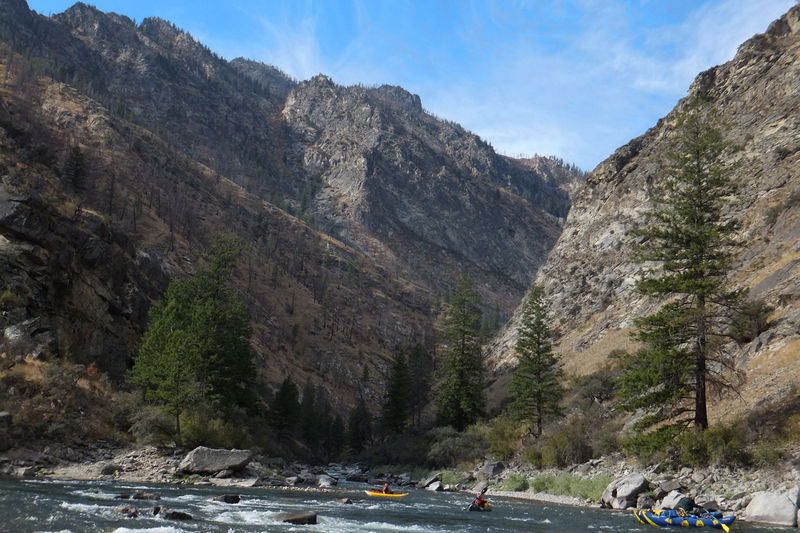 The Handbook to the Middle Fork of the Salmon River (guidebook by Quinn, Quinn, Quinn, and King) catalogs 341 rapids, not including any on the Main Salmon. 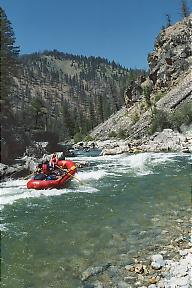 They designate 23 class III rapids and 7 class IV rapids. 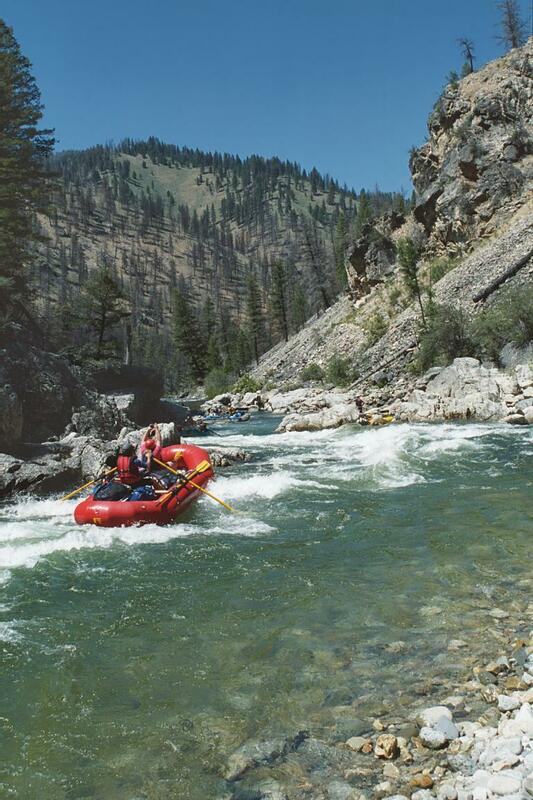 I feel that they overrate class IV and underrate class I rapids, but their guidebook is worthwhile for pictures and history. At high water, Impassible Canyon is definitely class IV. A newer 2006 guidebook by Matt Leidecker, Middle Fork of the Salmon River, is certainly worth purchasing if you want lots of information about the rapids and side hikes. Additionally, the rangers distribute an excellent waterproof map as part of your put-in briefing and equipment check. 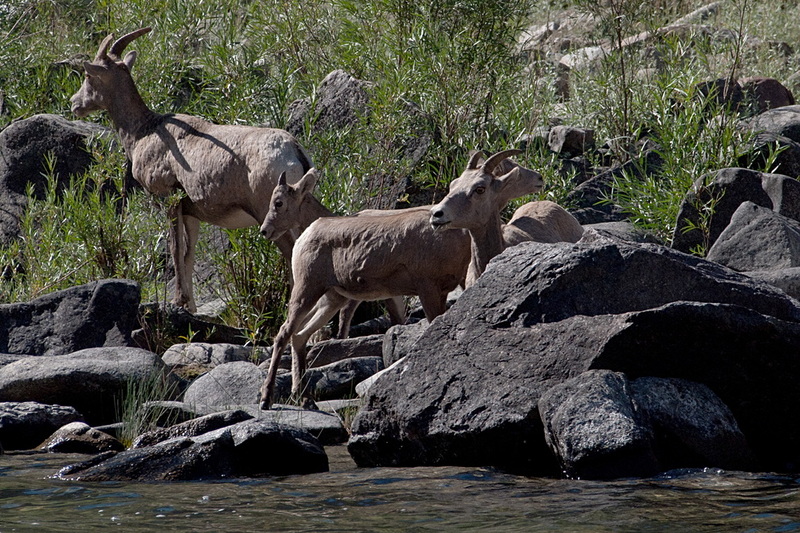 Photographs were taken on different trips, all at moderately low flows between 1.8 and 3 feet on the gauge. Put in at the Boundary Creek launch site, where a handy wooden boat ramp helps you lower big boats to the river. A ranger cabin and group briefing area are at the top. Uphill about a quarter mile is the Boundary Creek campsite, where most boaters stay the night before. 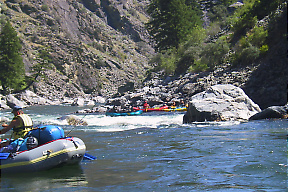 First Bend rapid, with several islands. The normal route is a tight passage on the far right. The low water route is a narrow slot just left of the rightmost island. A trail follows the left bank, but no bridge crosses the river until 25 miles downstream. At a relatively calm stretch, after Gardells Hole, the river bends left among rocks. At medium flows, the center route is relatively easy. At low flows, this rapid gets very bony. The river bends right and narrows into a chute, just above Rams Horn Creek. The river is continuous in this section. An unnamed creek (not Velvet) enters on the right, followed by Hell's Something-or-Other rapid (need better name). With little or no respite in the whitewater, Velvet Creek enters on the right. The whitewater and creek obscure the sound of the falls, hence its name. At high and medium flows Velvet Falls can stop and swamp boats, so the standard route is a diagonal tongue on the far left. At lower flows big rafts can usually run the falls on the right. At high flows a sneak route on the far left becomes available. Downstream of a bench camp is Trail Flat hot-springs on the left, in the cobble floodplain only slightly above river level. Usually run on the left, or center working left. At medium flows this one is unremarkable, but it is very bony at low flows. Below 2' it might be worse than Sulphur Slide. 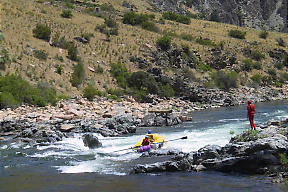 A long rapid that passes an old mining structure on the right, which you might not see if you concentrate on reading and running. The beginning is a rock garden, followed by a long, less rocky straight-away, finishing with an S turn containing big waves bouncing off the right-hand wall. Soldier Creek enters on the right, across from Joe Bump cabin site and a big campsite on river left. Sheepeater hot-springs and campsite on the left. 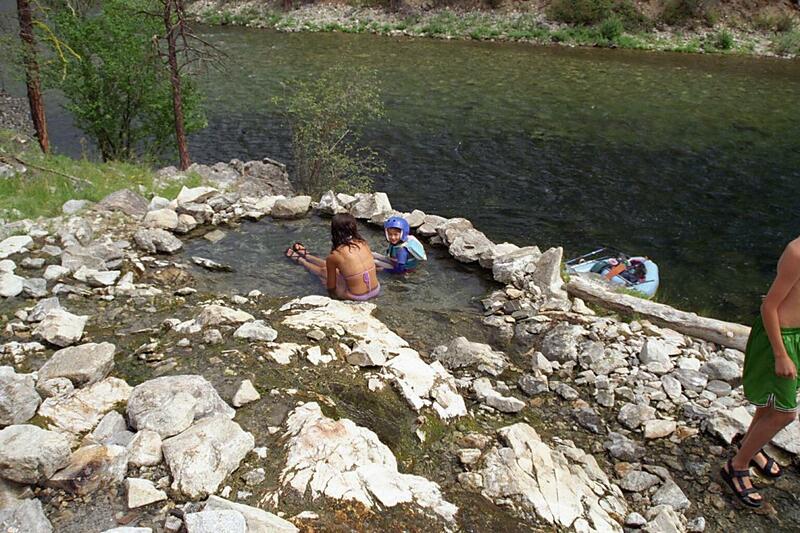 The hot-springs is on a bench above river level across a stone-studded warm lake. Rapid River, really a large creek on the right, adds significant flow. It is class IV with road access, and looks runnable into the summer. A trail comes in here, and follows the right bank downstream. Dolly Lake, a slowly moving section at a left-hand bend. Small camp on the left is misnamed Big Snag on the USFS campsite inventory, and a large camp on the right shortly below is misnamed Dolly Lake. 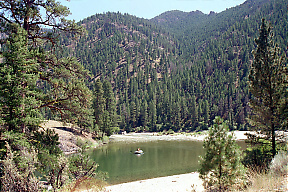 Lake Creek Rapid, new in 2006, caused by burned trees trunks (from the 2000 Pistol Creek fire) washing down the Lake Creek drainage. At first it required portaging, but it is gradually eroding into a safer, if still significant, class III rapid. Entrance chutes on the left and far right, with shallow gravel-island section in the middle. The curving left channel is wider but riskier, being blocked by a large rock (hole at higher flows) near the left wall. 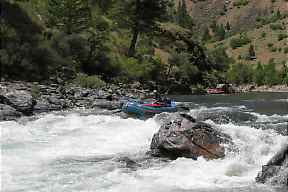 As flows lessen, big boats are increasingly forced to take the left channel. Difficult to scout, but you can land well upstream on the right and climb over a cliff to see the hole-rock-wall configuration on the left. Following the initial entrance drop is an S-turn with rocky cliffs on both sides, creating major hydraulics. Good campsite below the rapid, where Pistol Creek comes in on the left. Indian Creek USFS guard station and airstrip on the left bank. Alternate put-in when flows are very low, or a place to fly-in gear. Indian Creek comes shortly below on the left; good campsite there. A pack bridge crosses the river, allowing access upstream to the Rapid River trail. This is the only major rapid between Pistol Creek and Tappan Falls. At moderate flows there is a chute on the left, a big hole in the center, and a possible sneak route (difficult to reach) on the right. Marble Creek enters on the left. A trail leads up this creek, and a pack bridge is visible from the river. Sunshine hot-springs on the right, perhaps the nicest of all. A waterfall from the pool above forms a shower configuration. Middle Fork Lodge, a private guest ranch with no public services, but road access. Flow is measured where a bridge crosses the river. Another pack bridge crosses the river, with a trail that leads to Little Creek USFS guard station. Shortly downstream is Hood Ranch, with a cute cabin upstream and a somewhat muddy hot-spring downstream at nearly-dry Sunflower Creek. Cougar Creek enters on the right, across from Mahoney airstrip. Whitey Cox gravesite and hot-springs high on the right bank, after a right bend but before a left bend. 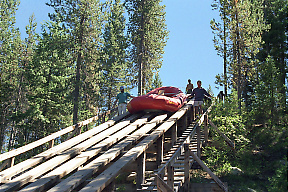 White Creek pack bridge. The trail on the left bank ends, while the trail on the right bank continues downstream. Loon Creek enters on the right. Large campsite with little shade below Simplot Ranch and airstrip on the hill above. 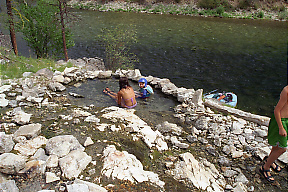 An excellent hot-springs is located about a mile upstream along Loon Creek. Hospital Bar hot-springs on the left bank, with campsite downstream. This is the last hot-springs along the river. Tappan Ranch (private) on the right at the mouth of Grouse Creek. Tappan Island, with campsite, splits the river. 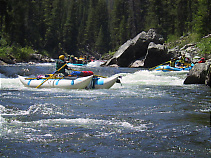 Tappan 1, class II+, announces a series of rapids. Scouting probably isn't necessary because the easy route has been in the middle or right of the right-side falls, but you might want to eddy out and have photographers walk down the right bank. 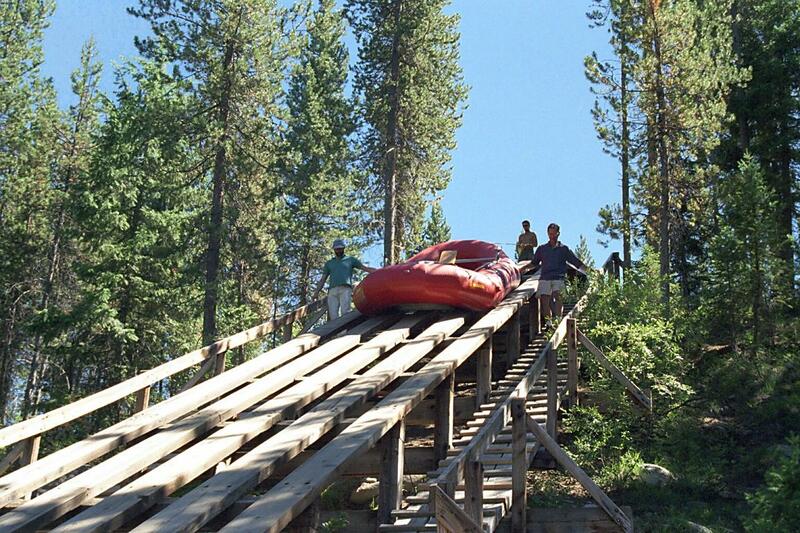 Kayaks can run all chutes. Tappan 2, formerly class III, but mostly submerged now. This is followed by Tappan 3, made more difficult by a recent landslide, possibly still class IV. Camas Creek enters on the right. 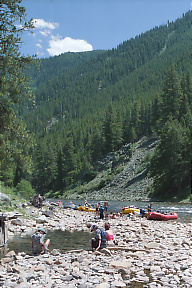 Campsite is hard to reach at low flows. A trail leads upstream. Johnny Walker, a good campsite on the left. Shortly downstream on the right is Kaufman's Cave, home to a miner. Some ways below that on the left is an excellent pictograph cave. Aparejo Point rapid, class III-, where the river bends sharp left. So-called Mormon Ranch, where Warm Springs comes in on the right. This used to be a beautiful place before the August 2000 fire, and is still worth visiting. A Mormon rancher raised his family here, using a warm-springs and side-creek for hot and cold running water. Brush Creek enters on the left, shortly below two islands. Flying B Ranch, with general store and airstrip, on the left. Beer, ice cream, and ice replenishment available. The river bends slowly right around the Flying B airstrip, then charges into this long boulder garden. The route is usually left of center past a large boulder, then right into another rapid that appeared only recently. This is the favorite rapid of many boaters. 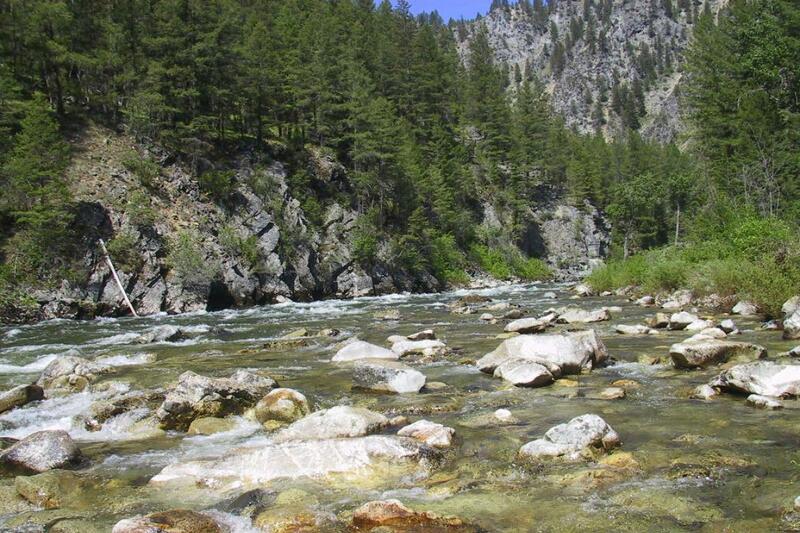 At high flows you might want to stop on the right and scout by trail from a rocky promontory. Rattlesnake Cave on the right, with Indian pictographs. Waterfall Creek enters on the right. Shortly below, a pack bridge crosses the river; the river trail soon ends. On river right, a trail climbs west out of the canyon to Bighorn Crags. On the left, a trail leads up Big Creek 4 miles to Soldier Bar airstrip, and further up reaches a trail to take-out that climbs over a mountain to avoid Impassible Canyon. Big Creek, the largest tributary so far, enters on the left shortly below beautiful Waterfall Creek on the right. 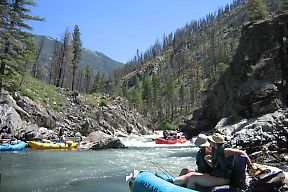 Good fishing up the creek, and excellent creek-style kayaking, but there is only a small campsite nearby. Unnamed class III rapid, not in most guidebooks, but seems to flip its fair share of kayaks. Elk Bar, a beautiful campsite on the left. 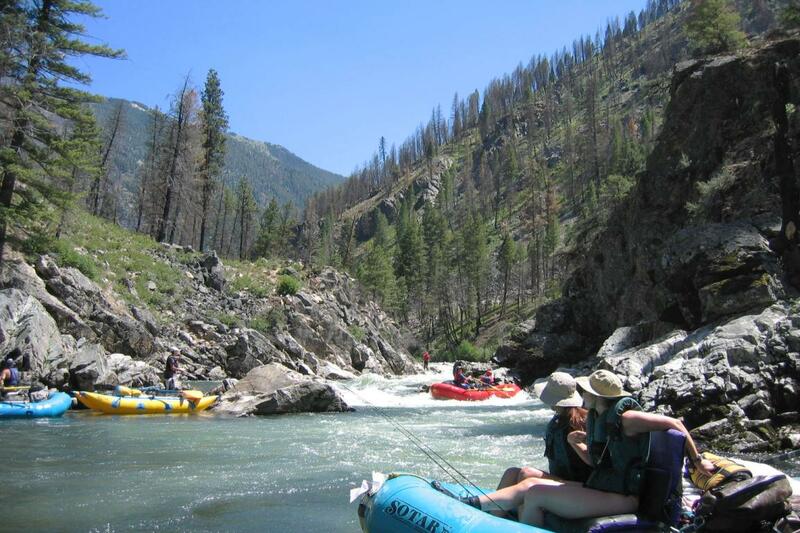 During permit season, only one camp allowed between Big Creek and the confluence. Veil Falls high up on the right bank. It is well worth the strenuous climb to see Veil Falls from underneath. There are some Indian pictographs in the alcove below the falls. Porcupine Rapids, AKA Wall Creek Rapid, class III, at a high rock wall on the right. 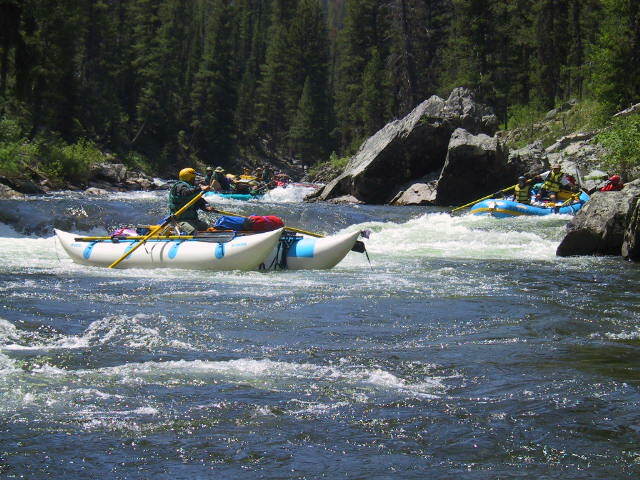 The normal route is right of center thru a gateway of rocks, then just right of a set of midstream rocks (holes at high water), then immediately working left to avoid a large midstream boulder, and finally avoiding a rock to the far left. Submerged rock extends into the river from both banks. Can be run different ways. The left side is a straight shot with big waves. The right side requires working back to midstream after passing some submerged rocks (holes at high water). Mist Falls can be seen on the right, above a class III- rapid. 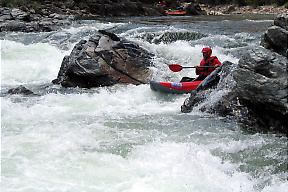 In the midst of a class II rapid, Tombstone Draw enters on the left. Indian pictographs may be visible from river level. Parrot Placer Camp on the right bank. Earl Parrot's lower cabin site on the left bank. Excellent place to take portraits in the doorway of the old cabin. Nice side hike uphill to a waterfalls on Parrot Creek. The river bends right and piles into a cliff. 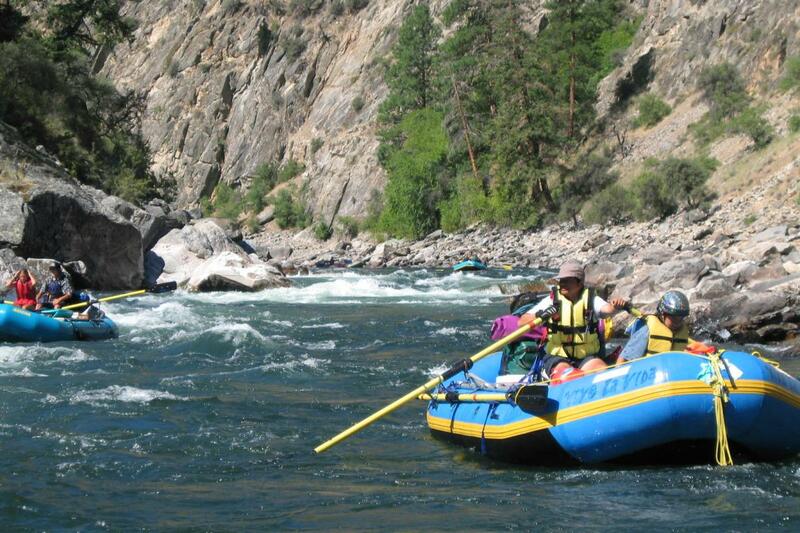 Easy in a oar raft; it just requires some pulling back from the wall. Apparently more difficult for kayaks; lots of swims occur here. The river bends sharp left around a cliff, and you are surprised by the sudden appearance of large rocks in the channel. Very significant at high flows, when you want to keep inside the curve..
Stoddard Bar, large camp (even at high water) on the left. 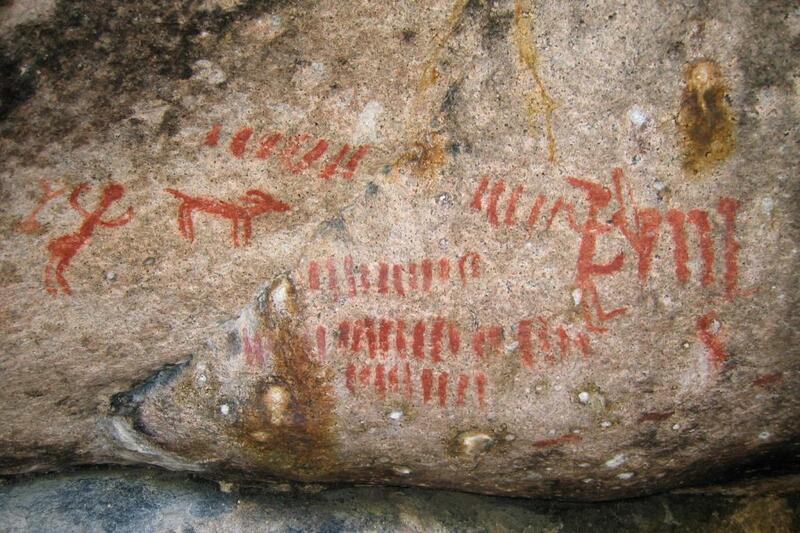 Excellent Indian pictographs on a cliff up Stoddard Creek. Otter Bar, beautiful camp with sandy beach on the right. 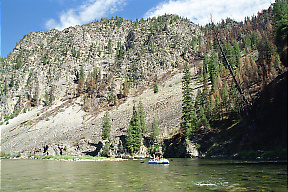 The riverbed narrows where a rockslide has occurred on the left, creating some large hydraulics, especially at high flows. This is considered the hardest rapid during high water, and recently become more difficult at low and moderate flows. 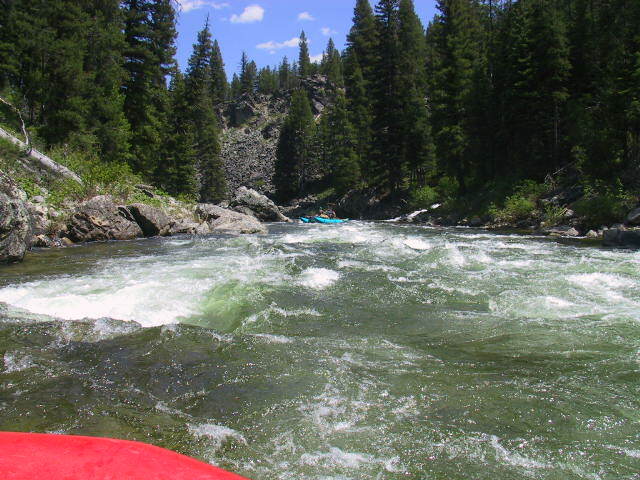 The river curves right thru an easy rapid, then gets more difficult after Roaring Creek enters on the right. The normal route is right of center, passing about 3 meters to the right of a large midstream boulder called the Shark Fin. Large waves follow, along a cliff on the right. Hancock is a very long rapid. Big boulders litter the river at Devil's Molar, which is easy. 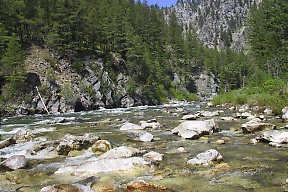 Shortly downstream, sharp boulders block the river at Devil's Canine. 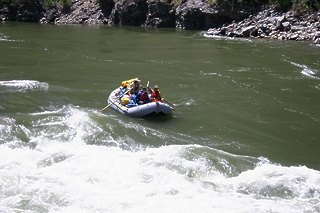 The normal raft route is thru a falls and large hole in the middle, then working away from boulders on the right bank. 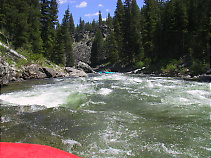 At low flows, kayak sneak routes are available on the left, but at high flows, the left side drop recirculates. 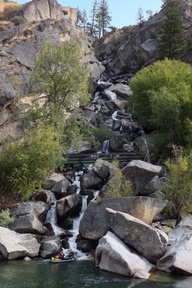 Several large boulders create multiple channels, with a dangerous-looking seive (2011) under mid-stream boulders. 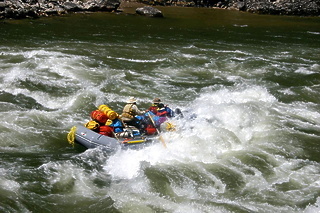 Often run left at lower flows, and at higher flows. The river drops suddenly, but the midstream run is straightforward. 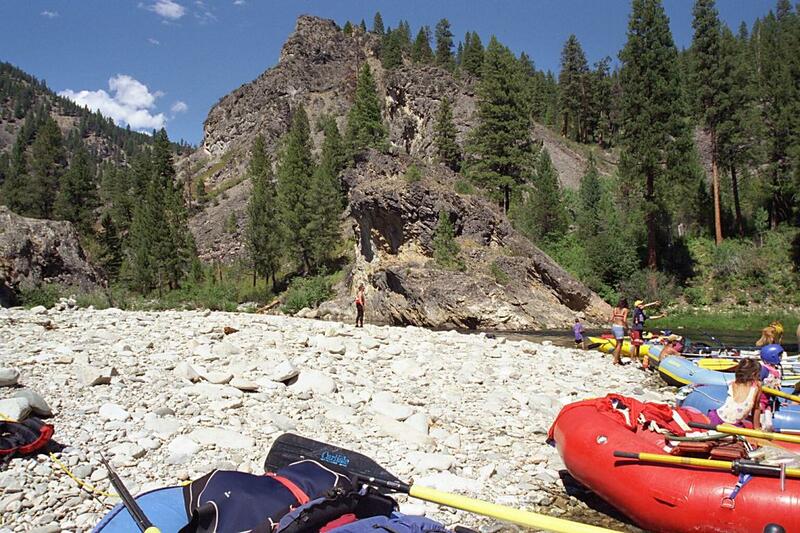 After a class II rapid, Goat Creek enters on the right, just below a sandy beach that makes a good lunch stop. Confluence with the Main Salmon. 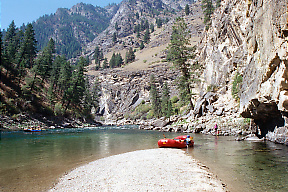 The semi-turbid water of the Main mixes slowly with the clearer water of the Middle Fork. This relatively new rapid was created by a mudslide in August 2003. Except at high flow, the safest route is down the right side, perhaps starting in the center, perhaps not (the rocks are still moving). Entering Cramer rapid right of center Raft goes for the big stuff, sideways! Take out at the designated boat access ramp at Cache Bar. You can take out just below the confluence to avoid Cramer Rapid, but the boat ramp there is steep and dusty. Shuttle service is available in Salmon Idaho and elsewhere, for example here and here. To reach put-in, take highway 21 northeast from Boise or east from highway 75 at Stanley. Near the top of the pass, 37 miles north of Lowman or 24 miles from Stanley, turn northwest onto unpaved USFS Road 579. After about 10 miles of good meadow scenery and creek crossings, bear right onto Road 568 and continue 13 more miles to Boundary Creek. To return to civilization from take-out, assuming paid shuttle, drive east (upstream) from Cache Bar on USFS Road 030, unpaved at first. You probably will want to stop at the toilet wash-out facility. After about 40 miles, turn south onto highway 93 towards Salmon. Motorists destined for Twin Falls usually find highway 93 thru Arco faster than highway 75 thru Sun Valley. Camping is generally available at Craters of the Moon. Advance reservations are recommended for motels in Twin Falls. To find nearby food and lodging, type Stanley Idaho into the box and click Search.